Whew! Are you as thankful for Labor Day as I am? I hope that you are doing something that you love today! Know what I love? Getting ahead! Yep, I'm spending today getting ahead a bit....meaning, look for lots more blog posts from me this week! And, I'm kicking it off with a giveaway! I am definitely a girly-girl! I love PINK. My husband makes fun of me, because when we walk down the aisles of Target I'm always drawn toward the pink products. Shaving cream? Yep, the pink can. Body wash? Whatever comes in pink! New hairdryer? My hand automatically grabs the pink one! If you haven't tried this pencil sharpener yet, what are you waiting for?? You can read my initial review of this awesome little machine HERE. My kiddos this year gave it "ooh's and aah's" when I taught them how to use it and showed them how it gives perfectly sharp points every single time! 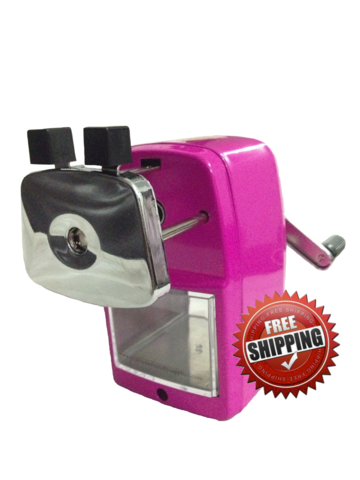 I honestly thought this sharpener was perfection....and then they went and made it in PINK! Why pink? To help in the fight against cancer. One dollar from every sale goes to cancer research and awareness. Did you know that September is Childhood Cancer Awareness Month and October is Breast Cancer Awareness Month? A perfect pencil sharpener....in precious pink....that helps in the fight against cancer...Now that, my friends, is the ultimate pencil sharpener! You can win your own right here! Just enter below and I'll pick a winner on Friday! alexslemonade.org that does AMAZING things. Research is the way to find a cure! A couple of co-workers have this pencil sharpener and it works so great! Awesome giveaway! I tried to order one of these a few years ago, but they didn't ship to Canada.... maybe I should look into it again now that they are more popular. Did you have to do a side by side comparison of my old school sharpener and your fancy dancy one? Really? Have a great school year! Love this pink sharpener! It would look great in my room! Love the pink sharpener! Thanks for sharing. E is for effort. I keep trying to win one of these babies!! Thanks for the giveaway!